NPD Solarbuzz reports the top 20 solar photovoltaic (PV) module suppliers accounted for almost 70% of global PV shipments in Q1’13. As the solar PV industry continues to show increasing globalization of end-market demand, tier 1 solar PV module suppliers are implementing aggressive overseas marketing strategies to increase market share. This is most evident among the top 10 Chinese tier 1 PV module suppliers such as Yingli Green Energy, Trina Solar, Canadian Solar, Jinko Solar, and Renesola. Chinese solar PV module suppliers continue to dominate the global supply landscape, with 41% of module shipments coming from the top 10 tier 1 Chinese suppliers over the past four quarters. Emerging Chinese tier 1 suppliers that had previously been focused on PV cell manufacturing, such as JA Solar and Hareon Solar, also gained market share as they increased solar PV module shipments. Over the last four quarters, US based manufacturers First Solar and SunPower were the leaders in module shipments to the US market. In Japan, leading domestic PV module suppliers Sharp, Kyocera, Panasonic, and Solar Frontier also outperformed Chinese competitors during the same time period. Solar PV module supply to the US and Japan is contrasted by the dominance of tier 1 Chinese module suppliers in European countries, emerging solar PV regions, and in China and Australia. 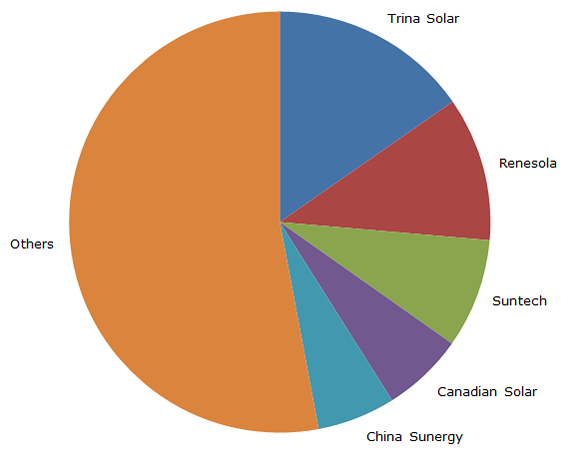 Over the past four quarters, for example, almost 50% of modules shipped to the Australian PV market have been supplied by a small group of tier 1 Chinese manufacturers led by Trina Solar, followed by Renesola, Suntech, China Sunergy, and Canadian Solar. Leading European tier 1 PV module suppliers, such as Conergy and SolarWorld, continue to target European and North American PV markets that are characterized by brand recognition and higher pricing levels. However, this strategy comes at the expense of global penetration, as their market share within the top 20 module suppliers declined from 10% in Q1’12 to 7.5% in Q1’13. While solar PV module pricing levels continue to vary across the key solar PV end-markets, the average sales price for the top 20 tier 1 suppliers showed signs that it was stabilizing at $0.76/Watt in Q1’13. This compares to $1.03/Watt in Q1’12. Trade disputes and domestic manufacturing incentives are creating import restrictions across a range of PV end markets, so supplier market share and country specific pricing levels will increasingly dominate the global strategies being rolled out by leading tier 1 module suppliers for the remainder of 2013.